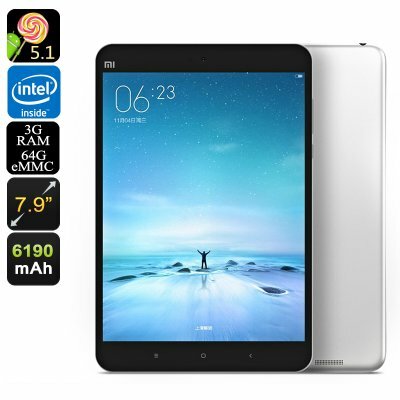 Successfully Added Xiaomi Mi Pad 2 Android Tablet - 64GB Memeory, 7.9 Inch 2K Retina Screen, Intel Atom CPU, 2GB RAM, Dual Band Wi-Fi (Silver) to your Shopping Cart. With a premium build and components is surprising that Xiaomi has managed to keep the Mi Pad 2 an affordable tablet PC as at under $250 this budget tablet PC is a real snip. At just under 7 mm thick and weighing a mere 330 grams the 7.9 inch Mi Pad 2 Android tablet PC remains light and portable but thanks to its beautiful, all aluminum body it remains strong and durable marking it out as one of the best-built tablets you'll find for under $250. With Intel Atom X5-Z8500 processor clocked at 2.2Ghzm 2GB of RAM and its retina screen this Android tablet PC carries the Wow factor over to its performance as well making it the best in its class and the perfect medium for browsing the web, watching TV, playing games or reading. All the content will look sublime on the 7.9-inch retina screen that boasts captivating 2048x1536 resolutions. this will bring your media to life and make for an immersive viewing experience whether it be games or movies so you'll feel like you're in the thick of the action. The Xiaomi Mi Pad 2 Android Tablet PC comes with a 12 months warranty, brought to you by the leader in electronic gadgets as well as wholesale Android tablet PCs..